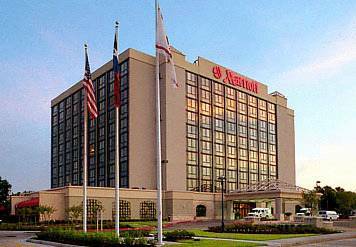 Discover the Lone Star State during your stay at Houston Marriott South Hobby Airport. Our Houston Hobby Airport hotels 287 deluxe guest rooms offer 32-inch plasma TVs, HD programming, digital media interface capabilities and comfortable bedding for the ultimate in relaxation. Experience our hotel near Hobby Airport with newly updated health center featuring an indoor swimming pool, whirlpool and outdoor patio to help you unwind after a day of meetings or sightseeing. For added convenience, our Hobby Airport hotels amenities include our exclusive M Club Lounge , 24-hour business center, ATM, sundry shop, laundry services, complimentary parking and a 24-hour complimentary shuttle to Hobby Airport. Event hosts can wine and dine guests in 21,500 square feet of flexible meeting space that holds up to 1,000 people. Stay close to area attractions, including Toyota Center, Minute Maid Park, NRG Park, NASA, University of Houston, Kemah Boardwalk and Galveston to experience the best of Houston. Our Hobby Airport restaurant offers a relaxing atmosphere with 13 plasma screen TVs, so diners can catch the game while dining with friends. We serve the finest selection of seafood and steaks that leaves guests wanting more every time they finish a meal. Atrium Cafe features a breakfast buffet 7 days a week.